The day was May 10. Emergency dispatchers took a call reporting a heart attack on Backwoods Road in Century. Lt. Bart Fryer and Senior Deputy David Bashore arrived to find a person unresponsive with no pulse on a bathroom floor. 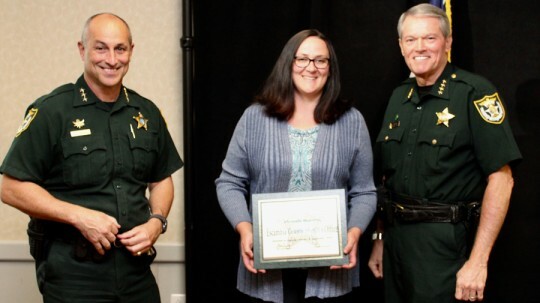 Bashore connected an AED, shocking the person twice. He and Fryer continued CPR until the Flomation Fire Department arrived. The patient airlifted by LifeFlight helicopter to Jay Hospital and survived. Fryer and Bashore (pictured top) were two of four Escambia County deputies receiving a Lifesaving Medal Tuesday during a quarterly awards ceremony at the Escambia County Sheriff’s Office. Deputy Jimmie Wiggins III was awarded a lifesaving medal after a patient in cardiac arrest was saved on Cruzat Way in early May; and Sgt. Matthew Roe for his part in saving the life of a female with no pulse on Patton Drive last May. Sgt. 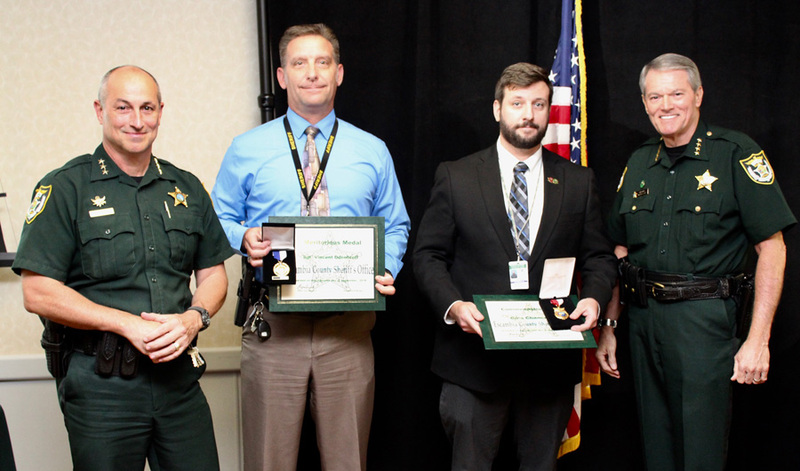 Vincent Odenbrett received a Meritorious Service Medal and Cole Chancellor received a Commendation Medals for their work on the department’s accreditation. 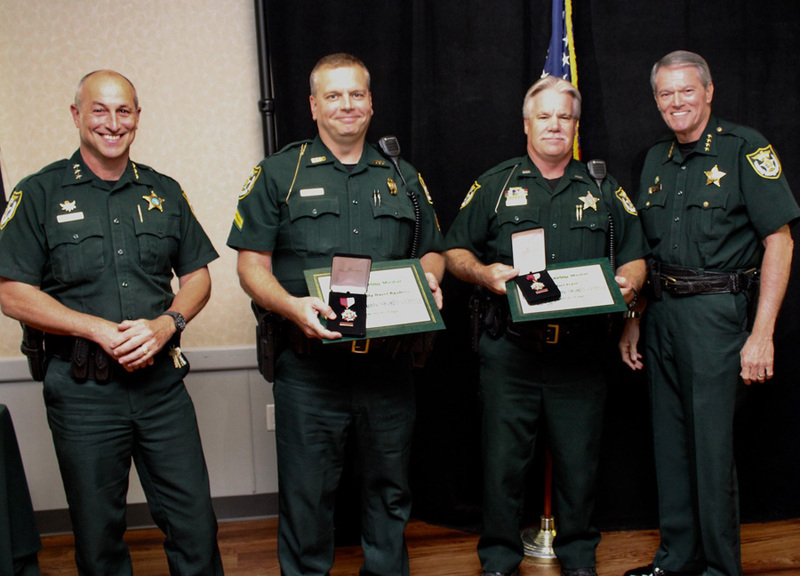 Multiple deputies received Commendation Medals for their part in cleaning up a property on Winners Circle in Cantonment for an elderly Marine Corp veteran unable to care of it himself. 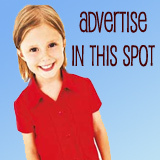 [Read story...] They are: Lt. Jack Holland, Sgt. 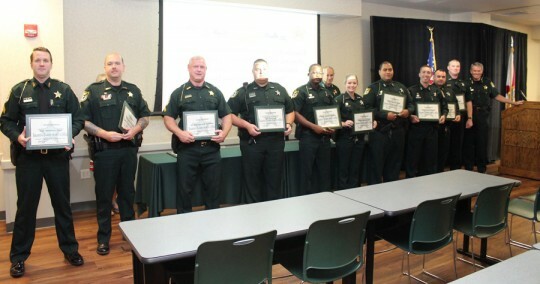 Brian Shorette, Deputy Matthew Johnson, Deputy 1st Class Ellis Smallwood, Deputy Jake Bandurski, Sr. Deputy Jeff Gardner, Deputy Justin Fountain, Deputy Andrew Kelley and Deputy 1st Class Mildred Smallwood are awarded the Commendation Medal and Citizen Joshua Swindell was awarded the Civilian Service Medal for his assistance. 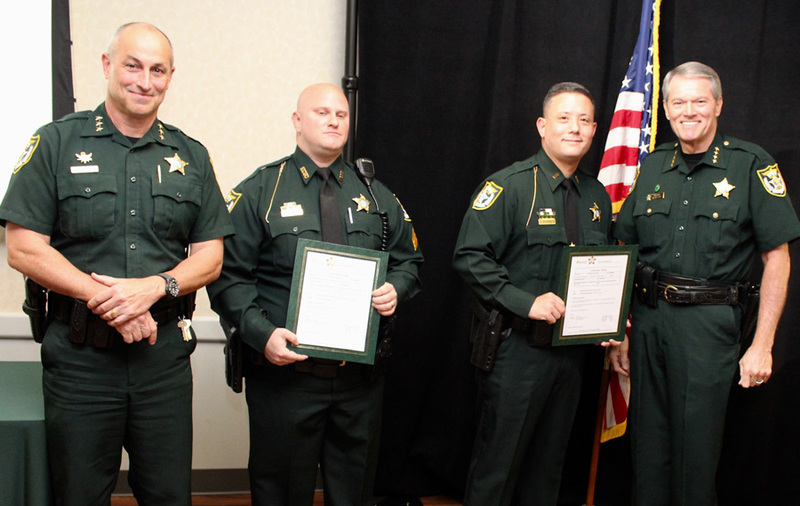 Unit Citations were awarded to Lt. Marcus Murphy, Sgt. Matthew Roe, Sgt. 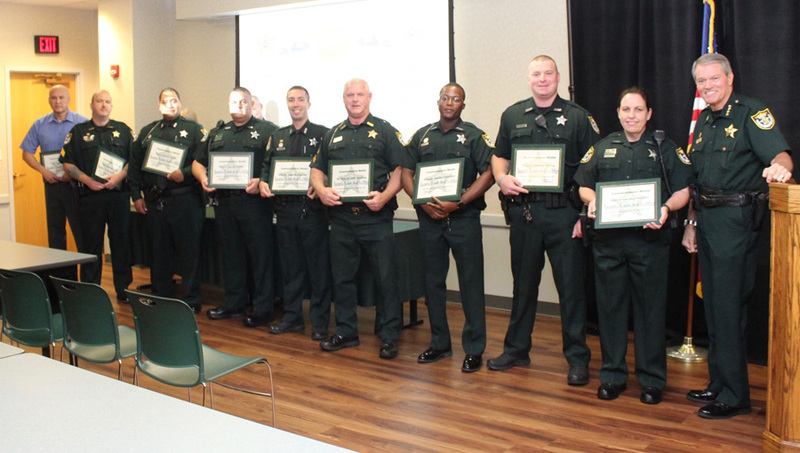 Brian Shorette, Sr. Deputy Jeff Gardner, Deputy 1st Class Caleb Odom, Deputy 1st Class Ellis Smallwood, Deputy Justin Fountain, Deputy Katrina Ivins, Deputy Matthew Johnson, Deputy Jake Bandurski, Deputy Andrew Kelley, Deputy Troy Luckenbill, and Deputy Miguel Felan. Elizabeth Medeiros was named the Law Enforcement Employee of the Quarter. 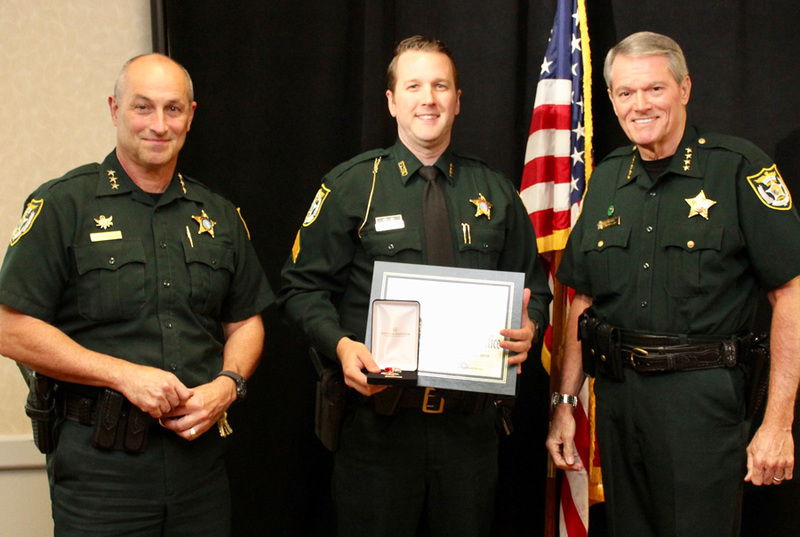 Deputy Kyle Haver was named Law Enforcement Employee of the Quarter. Congratulations to all Proud to know you Jimmy Wiggins! CONGRATULATIONS! Good to see such recognition for your service. I love this!!! !Officer Bashore is a remarkable person!!!! He also,has a remarkable family!!!! Northend loves him and his family!!! A great family man!! I do not kinow the other officers,but I am very grateful for ALL they do!!! Thank you ALL for what you do every day of your lives!!!!!!!!!!!! !So thankful to have dedicated men and women who risk their lives to make sure we are safe!!!! Continue on,please!!!!!! 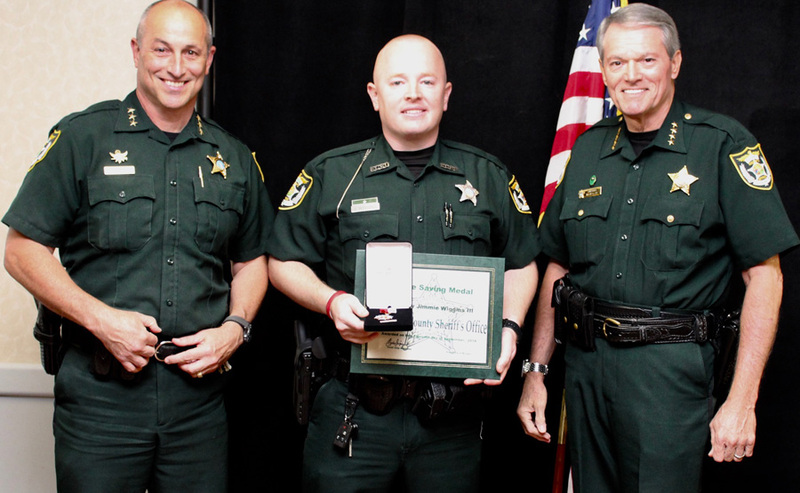 Congratulations Officer Bashore! We are proud to know you. Thank you for your continued service to our community not only in the line of duty but through volunteer service throughout our schools and neighborhoods. May God bless you and your family and keep you safe.